My beginning was July 13th, 1951. You can check it, but it was a Friday. So this alone is no grand event, but in 2015 when I go to the gate to board the jet to Johannesburg, the departure time read: 7:13... At first was just fun for me, but later as I grew to understand the bigger picture it was only to start to making more connections to my creator than I ever had in my life. As you know there are 52 weeks in a year and again, a moment was coming into focus. The trip that first took me to Swaziland was scheduled by others on my birthday week in 2015. So I celebrated my birthday in Bulembu, Swaziland with 40 other mission going folks in 2015 and again I was touched that they gave me a small "party" with even a cake. My workgroup was assigned to tear down a burned out concrete block home and repurpose the oversized concrete blocks and build never ending steps up the hillside. The work was enjoyable and we took turns playing our favorite music lists. Now we had been working on various projects on prior days and I was not always with the same bunch of people. However, here is the moment or rather the song that would turn out to be so uplifting and moving of all the Co-Inky-Dinks. My playlist had more music on it that could be played in an eight hour day. So one would expect that no one song would play every day. But there was one... Solsbury Hill by Peter Gabriel. I had always liked the song, but had never really understood all the words. So I went on hearing it everyday and made a point to research it whenever I got back home. Keep in mind I had not really been called yet to go back year after year to Swaziland and lead my own mission team during the first days in Bulembu and so the song merely was just more "fun" for me on the trip. When I did During that first week in Bulembu, I was surrounded by Godly people. People who testified to us each night. People who told us how they walked away from their current place in life and was called to go to Bulembu and serve. After a few days, I too was called and it was loud and clear: Bring your own group next year​ Believe me this was no coincidence and there was no grey area here, but pure instructions from God. Then when I got back home and saw the words to Solsberry Hill and made the music video: I knew that I must do this. From now on the remaining Co-Inky-Dinks all were an offshoot of me attempting to carry out God's directive to me. When I got your email last night, I looked at my phone and immediately two more emails popped up. See this screen shot of my phone’s screen. 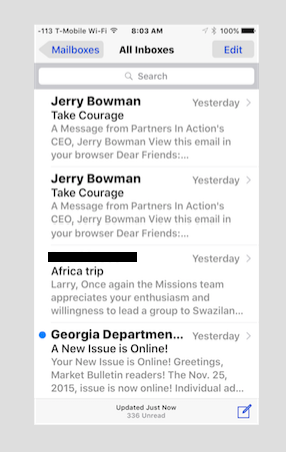 I am sure you are familiar with Jerry Bowman organization, Partner’s In Action’s - http://www.partnersinaction.org Both emails were titled "Take Courage". God is speaking to me so strongly about taking my own team to Bulembu, Swaziland; that I can not turn him down. God wants me take a team to Bulembu. Every time some deterrent comes up, he allows me to see past it to the goal post. Imagine this, I am reading your message below and when I get to the part where I see the words "postpone the trip". The screen vibrates and up comes “TAKE COURAGE” ! Tears started to form in my eyes, but I could see through the blurring water that God was telling me to go on without my church’s support. I told him I would sleep on it, yet I heard him say: “Let the people decide”. He told me to keep telling the truth and all will be good. Wow, when the two emails came in right at the time I was about to read the mission committee's email I was immediately choked up with emotion. I went from feeling like I had been hung drawn and quartered to feeling I had God on my side! What a feeling. The words Take Courage resonated deep in my soul and so I did take courage and begin the next phase of my endeavor. I have never been patient. So I presented the mission trip to my Sunday School Class and got one taker. His initials are RA. So going into the end of 2015, I had three people signed up to go. Susan and RA and myself. This Co-Inky-Dink really sealed the deal for me on my vision to take my own mission group without my church's support. Every year the day after Christmas, Susan and I jump in the car and drive down to the East coast of Florida. It is the best time of the year for me to ride my road bike up and down A1A and Susan to shop for, well what ever. There is no traffic, hotel rooms are easy to get and restaurants are looking for patrons. We had just dumped A T & T cell phone service and had gone with T-Mobile and were saving a ton of money and not worried about how much data we were using. Here comes the punch line... Somewhere just inside the Florida line, I got the idea to tether my Airbook to my iPhone and catch up on organizing the trip to Africa. For you not tech type people, by tethering my Airbook to my iPhone, I could get on the internet at blazing LTE speeds and cruise the World Wide Web. One of the things I first did was to check the airfare and BANG! It had dropped to an all time low of $1,183 round trip from Atlanta to Johnanesburg! I immediately thought: God you made me do this and I thank you! The price and been around $1,500 for months. Sure it is not much difference but I quickly called it a Co-Inky-Dink and booked it while Susan was driving down I-75 at 77 miles an hour. I also quickly sent out text messages to all those that were still thinking about going in 2016 and told them to book it or lose it. RA booked his flight soon afterwards. This Co-Inky-Dink is kind of a far reaching one. Far reaching because we had to fly to New Zealand to make it happen. So here is the back story. We had booked an ocean cruise that visited New Zealand and Australia for early 2016. It started in New Zealand and so we had to fly to Auckland. Here is the Flights we chose to take: Atlanta to Los Angeles to Auckland, non stop. We have friends in Los Angeles and thought it would be fun to drop in on them and spend a night or two. While we were staying in their home, their son had just dropped in for a short visit with his best friend, who was from Johannesburg! Anyway, I take out my Airbook and hook it up with an HDMI cable to their big screen TV and do a slide show on my planned Mission Trip to Africa. My friends said they were in and would go!... I now had five heads signed up to go on my mission! The same head count that were going to Russia with BR. Remember BR? Well he ended up taking four others to Siberia and later that year decided to quit our church. Just had to put this is to close out this paragraph. Oh, I almost forgot, we met our friends from Los Angeles on a random trip we took to China!